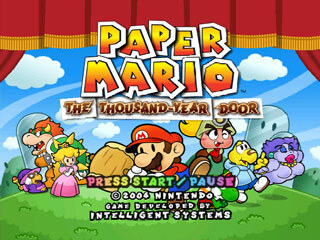 Because of the longer English title, the background image was moved down to make more room for the logo, and Goombella was moved down and to the right. Under the "Press Start" message, the capitalization of "Nintendo" and "Game developed by" was changed to small caps. In the Japanese game, the Power Rush badge has a "P" on it. For some reason, it was changed to a "D" for the U.S. version. The U.S. ROM also contains the original P version, as well as K, A, and C versions, presumably for other languages (another example of this in the U.S. ROM is the Japanese, English, French, Spanish, Italian, and German versions of the "Good" message that appears when you successfully execute a timed attack in battle). The Wrestling Mag sprite was changed, probably because of the Japanese writing on the cover. The Japanese sprite says Puroresu ("ProWres"), short for pro wrestling. 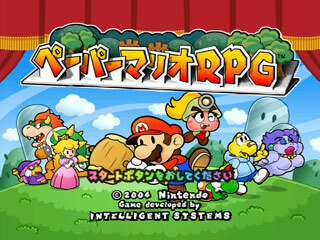 In the Japanese game, Doopliss is known as "Ranperu", and Mario must find the "n" character. Like most of the Japanese enemy names, "Ranperu" and his "n" are in the katakana syllabary. The parrot underneath Creepy Steeple has a couple of different phrases in the U.S. version. The localization team apparently had some fun here, changing one of the parrot's lines to "Shine get! Shine get! ", which refers to the semi-famous "Shine get!" phrase in the Japanese Super Mario Sunshine. - Good morning! Good morning! - Pretty bird! Pretty bird! - Shine get! Shine get! 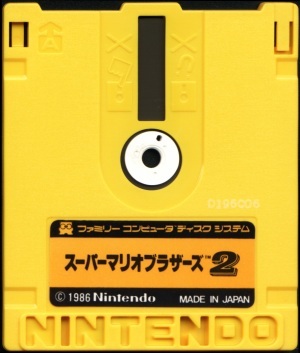 The "Data Disk" item found in Grodus' room looks like a Famicom Disk System game disk. When Peach inserts the disk into the computer, the FDS startup animation (with sound) displays on the monitor. Vivian was a boy in the Japanese game! That's Vivian. She's the youngest of the three Shadow Sirens. This is not the first time a Mario character has changed genders. Birdo, as introduced in the Super Mario Bros. 2 manual, "thinks he is a girl and he spits eggs from his mouth. He'd rather be called 'birdetta.'" However, recent games such as Super Smash Bros. Melee now refer to Birdo as a female. The house in the back alley of Rogueport's main square originally had a Toad-shaped chalk outline and dried blood on the floor. 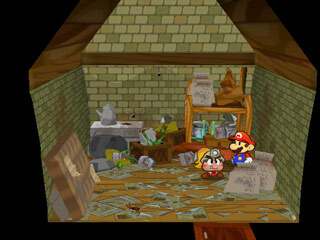 These signs of violence were removed for the U.S. version. In the Japanese game, Goombella says she's a student at "Kuriforunia University" (クリフォルニア大学). "Kuriforunia" is a combination of "Kuribō" (the Japanese name for Goombas) and California. This pun doesn't really work in English, so the school was changed to "University of Goom" for the U.S. version. Sometime after Chapter 6, a professor from Goombsley University is one of the random passengers you may see riding on the Excess Express. The Japanese name for the school is "Kūrihhi University" (クーリッヒ大学). Similar to Goombella's college, "Kūrihhi" comes from the Japanese name for Goombas: "Kuribō." One of the crows in Twilight Town hopes that her son gets into a school like "Crowhall University." This one was completely made up by the localization team; the crows don't mention a school name in the Japanese version. Creepy Steeple: Odoro in Odoron Temple comes from odorokasu, meaning "to surprise/frighten." Petalburg: Hana in Hanahana Village means "flower." ファビオ Fabio Fabio Doe T.
パック Pakku Pakku Heff T.
ケーブル Kēburu Kēburu Herb T.
キノッポ Kinoppo Kinoppo Niff T.
キーノ Kīno Kīno Pine T. Jr.
マッキノ Makkino Makkino Pine T. Sr.
キノッシモ Kinosshimo Kinosshimo Plenn T.
キノチェロ Kinochero Kinochero Thriff T.
キノベス Kinobesu Kinobesu Toce T.
ナンシー Nanshī Nancy Zess T.
Arfur: Rotten (pronounced "wrote-ten") comes from roten, which means "street stand." Bobbery: Bareru literally means "barrel." Charlieton: Damasu means "to trick/cheat/deceive." Freddy/Gloomer: In the English text, this Twilight Town resident is called "Freddy" three times and "Gloomer" once. Prince Mush: He is also referred to as キノシチョフ (Kinoshichofu) in the Japanese game. ブーメランブロス Būmeran Burosu Boomerang Bros. Boomerang Bro. ファイアブロス Faia Burosu Fire Bros. Fire Bro. ハンマーブロス Hanmā Burosu Hammer Bros. Hammer Bro. Bandit: Borodō is a play on the word dorobō, which means "thief." Rawk Hawk had one point subtracted from his Attack power, but one point added to his Defense power. Red Spike Top had his Defense power raised by one point. The following chart lists the fighter names along with their nicknames. "The Red Ore Fear Orbs"
Mirakuru Toraianguru The Triple Bros.
"The Big Bad Brute Bros."
"The Shell Machines of Doom"
"The Hardheads from Space" The Goomba Bros.
『ン』のもじ "n" no Moji The Character "n" The Letter "p"
Kame means "turtle," but most "kame" items in the Japanese game were changed to "Koopa." Icicle Pop Recovers 10 FP. Recovers 10 HP. Koopa Bun Recovers 20 FP. Recovers 15 FP. Zess Frappe Recovers 20 FP. Recovers 20 HP. Icicle Pop and Zess Frappe recover FP in the Japanese version and HP in the U.S. version. Koopa Bun's FP recovery was decreased by 5. Hizza: His Japanese name comes from a rearrangement of ダイジャ (Daija), which means "big snake." Thanks: Suffix and The Chef.